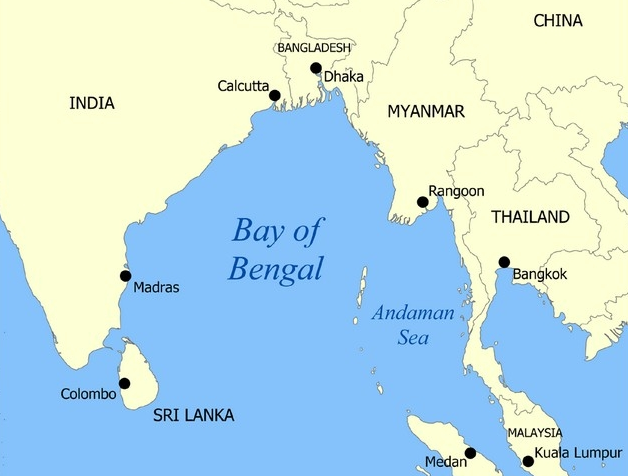 Paper presented at the conference on Buddhist-Muslim Tensions in the Bay of Bengal, organized by the Center for Asian Research, Arizona State University, USA, 8 and 9 October 2014. In this paper I shall attempt to analyze the underlying causes of tension and violence between Buddhists and Muslims in three countries around the Bay of Bengal, namely, Thailand, Myanmar and Sri Lanka. Are there certain common threads that run through the three cases? How have geopolitical factors impacted upon Buddhist-Muslim relations? I shall also examine how governments and people in the region have addressed challenges arising from relations between the two communities. This will include the role played by civil society actors. The paper will end with reflections on Buddhist-Muslim relations in the context of a changing world. Of the three countries around the Bay of Bengal, it is the conflict involving Thai Buddhists and Malay Muslims in Southern Thailand which has been going on for the longest while. (1) It has its roots in the Thai (Siamese) conquest of the independent Malay Sultanate of Pattani in 1785. Right from the beginning, the Malay Muslims of Pattani resisted Siamese Buddhist rule as evidenced in rebellions in 1791 and 1808. However, the Thai rulers maintained their grip and further consolidated their position through the Anglo-Siamese Treaty of 1909 which acknowledged a segment of the area covered by the old Sultanate — known today as Pattani, Yala, Narathiwat, Satun and Songkla — as part of the Thai kingdom. Because Thai rulers, especially some of the authoritarian military strongmen in the post second world war decades sought to assimilate Malay Muslims into the Thai way of life, resentment on the part of the latter gave rise to a series of liberation movements such as the Barisan Revolusi Nasional Pattani Melayu (BRN) in 1960, the Pattani United Liberation Organisation (PULO) in 1968 and BERSATU in 1989. ( 2) Since these movements pursued their goal of an independent nation called Pattani Darulsalam through violence, the Thai state also responded with force. The level of violence on both sides has ebbed and flowed over the decades. After a lull of sorts for a few years in the nineteen nineties, which seemed to coincide with the growth of democracy in Thailand, a new round of violence suddenly erupted in January 2004. It began “when an organized group of more than 50 men, according to some sources, raided an army depot in Narathiwat killing four soldiers and stealing some 100 rifles and a large quantity of ammunitions. Eighteen schools were also simultaneously set alight in what appeared to be well-coordinated attacks. Immediately after this incident more violence broke out with acts of arson, drive-by shootings and attacks against government officials and property.” (3) The kidnapping of a Muslim human rights lawyer who was defending some alleged Muslim terrorists, the arbitrary arrest and detention of a number of so-called Muslim militants and the inspection of mosques and madrasas (Islamic religious schools) by Thai officials, further exacerbated the situation. To make matters worse, Thai security forces “killed 107 suspected militants, many of whom were members of a local soccer team, who were accused of planning acts of terrorism. Thirty-two were gunned down inside the historic Krue Se Mosque in Pattani” (4) in April 2004. Though a government commission of inquiry found security personnel guilty of excessive force against the militants, Krue Se created a lot of anger against the government among the Muslims. Muslim anger reached a crescendo when another incident happened in October 2004. While “trying to break up a demonstration at the Tak Bai Police Station by about 1500 protesters who were demanding the release of six men accused of giving weapons to Islamic militants Thai security forces shot dead six protesters and detained over one thousand three hundred people. The detainees were then stacked like logs into a number of military trucks and transferred to a military camp on a journey which lasted as long as five hours for some of the detainees. Many later alleged that they were maltreated and even tortured and abused by the Thai security forces while under detention. As a result of this, almost 80 people died of suffocation while there were also claims that many more had been left unaccounted.”(5) The Tak Bai incident ignited a huge international outcry especially in the Muslim world. Prime Minister Thaksin Shinawatra was harshly condemned by groups and individuals right across the globe. His image was in tatters. As expected, Tak Bai generated even more acts of violence from both the militants and the government. In March 2012 for instance the militants coordinated car-bomb attacks in various parts of the South. The government now deploys about 60,000 security personnel in the three Malay Muslim provinces of Patani, Yala and Narathiwat. It has been estimated that since 2004, some 6000 people have been killed in the conflict, 60% of them Muslim and about 40% Buddhist. The question that one should ask at this point is this: What are the underlying causes of violence and conflict in Southern Thailand? Some of the answers have already been provided. The conquest of an independent entity with a different religion, culture and language which wants to maintain its own identity is an important explanation for the unending conflict. The situation has been exacerbated by concerted attempts by Thai elites at different times to assimilate Malay Muslims into what they regard as the nation’s identity. It arises from an inability on the part of the Thai elite to appreciate the fact that because of the way they perceive and practice their religion, Malay Muslims may exhibit a strong antipathy towards certain symbols, rituals and forms associated with the Thai Buddhist majority. The well-known Thai Malay-Muslim intellectual, Dr. Surin Pitsuwan — one of Thailand’s most effective inter-ethnic, inter-religious bridge-builders — has provided a number of examples of a collision as it were between two different cosmologies. He recounts an incident way back from 1983 when Ministry of Education officials in Bangkok thought it was alright to place a Buddha image beside the flagpole during the morning ceremony of singing the national anthem in those schools where there were also many Muslim students. (6) In more recent years, Muslim villagers receiving personal loans have been charged interest (usury) and scholarships awarded to students have been drawn from legalized gambling funds. (7) This lack of sensitivity to the religious sentiments of a minority is sometimes the product of a majoritarian psychology. It feeds the drive towards assimilation which is one of the causes of the alienation of the Malay Muslim in the South. When the drive towards assimilation is accompanied by authoritarian elite postures and policies, there is a real danger of serious damage to inter-ethnic relations. This happened when Thaksin Shinawatra was in power in the years leading to the tragic events of 2004. According to a researcher he “resorted to combative measures to tackle problems in the South, refusing to negotiate and compromise. He ordered the dissolution of the Southern Border Provinces Administrative Centre on April 1, 2002 and transferred the then Army Chief, Fourth Army Commander, Defense Minister, Provincial Governors, the Police Chief and Interior Minister to other posts and filled the vacancies with his close confidants who would comply to his demand for a quick solution.” (8) He ignored wise counsel on the resolution of the problems of the South in a peaceful manner. Instead, he initiated draconian measures and declared an emergency which further estranged the Malay Muslim population. This explains in part the abysmal performance of his party, the Thai Rak Thai, (TRT) in the Malay Muslim provinces in the February 2005 General Election. Although TRT “won overwhelmingly in all of Thailand securing more than a two-thirds majority, it suffered a major setback in the southern provinces where it lost all but one constituency.” (9). That the authoritarian approach is counter-productive becomes obvious when one contrasts it with the relative success of accommodative, conciliatory measures adopted within a democratic framework in addressing Malay Muslim challenges in Thailand. Such measures related to the acceptance of Islamic banking practices, the introduction of organized halal certification, and the streamlining of religious education, instituted in the democratic ethos of the nineties, have been among some of the attempts to provide Malay Muslims in the South with a sense of belonging to the larger Thai nation. Malay Muslims themselves have sought to advance their needs and interests through articulation and action via the democratic process. It was not just Shinawatra’s authoritarianism that turned the Malay Muslims against him. His open support for the Anglo-American invasion and occupation of Iraq in 2003 and his readiness to send Thai soldiers to fight under the banner of the invader disappointed and angered a lot of Muslims in the country. It was partly because of strong Muslim opposition that the Thai contingent was withdrawn from Iraq within a year. So far I have looked at those causes of the Thai Buddhist -Malay Muslim conflict which are connected to the Thai State and the Thai elites. But Malay Muslims opposed to the State are also responsible in a sense for the perpetuation of the conflict. Apart from their resort to violence, with all its dire consequences for the people in the region and the nation as a whole, many of the militant groups also subscribe to ideas about Islam and society which appear to be exclusive rather than inclusive, parochial rather than universal, retrogressive rather than progressive. There is some evidence to suggest that this is the result of the exposure of some of the key elements in these groups to narrow, conservative teachings associated with some of the madrasas in the three provinces, apart from Islamic institutions in South Asia and West Asia. In more concrete language, there is a Wahabi strain in the ideological outlook of a significant segment of the movement for the independence of the southern provinces. It is this outlook that hinders and hampers the ability of its leaders and followers to understand and empathize with the Buddhist Other. There are some important parallels between Thailand and Myanmar as my analysis of the conflict in Myanmar will reveal. But before that, I shall present a brief overview of the conflict itself — a conflict between a largely Buddhist elite and a Muslim ethnic minority known as the Rohingyas. It is this conflict that has captured media headlines in various parts of the world in the last few years. Discrimination against the Rohingyas, in a sense, began soon after a Burmese king annexed Arakan (now known as Rakhine) in 1784, the province in which the Rohingyas have lived for centuries, perhaps since the eighth century. There were episodes of violence though there were also long periods of relative harmony between Rohingya Muslims and Buddhists in Rakhine and between Muslims and Buddhists in the rest of Myanmar. In fact, in the early years of Independence, (10) Rohingyas were recognized as full citizens and participated in various sectors of national life, including politics and culture, apart from the economy. They served in parliament and “held positions in the country’s security forces and other ministries.” (11) Their language was broadcasted over the national broadcasting service three times a week and they were “ permitted to form their own communal, professional and student associations bearing the name “ Rohingya,” and above all, granted a special administrative region for the two large pockets in western Burma made up of 70 percent Rohingya Muslims.” (12) Of course, the Rohingyas, given their long association with commerce, were economically active in Rakhine and in Myanmar as a whole. Things began to change for the Rohingyas in early 1978. In the guise of a crackdown on illegal immigrants, the government started to target Rohingyas. 200,000 of them were forced to leave and relocate in Bangladesh. Their specific ethno-cultural identity was denied and they were labelled “Bengalis” since some recently domiciled groups in Rakhine had links with Bangladesh, the nation with which Rakhine shares a border. This operation against the Rohingyas culminated in a 1982 law which formally removed them from the list of officially recognized ethnic and religious minorities. It implied that Rohingyas qua Rohingyas were no longer citizens of Myanmar! In its recently concluded population census from 30 March 2014 to 10 April 2014 — the first in three decades — the Myanmar government refused to recognize the Rohingyas as a distinct ethnic group. It explains why in the last twenty to thirty years there has been a mass exodus of Rohingyas to a number of countries, notably, Bangladesh, Malaysia, Thailand, Indonesia, Australia, Canada and Saudi Arabia. The exodus, Zarni argues, is a direct consequence of all the acts of commission and omission against this minority of 1.3 million people. He asserts boldly that, “The military-controlled state of Myanmar — now headed by ex-general Thein Sein and his quasi-civilian government in Naypyidaw — has both paved the way for and carried out ethnic cleansing of the Rohingya. Ethnocide of the Rohingya has empowered the racist, ultra-nationalists among the local Buddhist Rakhine, national leaders and Buddhist society at large to dehumanize the Rohingya.” (15). It is against this backdrop that one should view the serious eruptions of violence that have occurred in recent years. In June 2012 for instance a number of Muslim males were killed when angry Buddhist mobs attacked a bus incensed by a baseless allegation that some passengers on that bus had raped and murdered a young Buddhist woman. In October of the same year there was another violent clash that resulted in the death of more than a hundred people mostly Rohingya. (16) There was another major episode in March 2013 that began in the district of Meikhtila. It resulted in forty-four deaths. 2014 has also witnessed violence between the two communities. What are the principal causes of this continuous turmoil and violence? As in the case of Thailand, the annexation and incorporation of a kingdom populated by a numerically significant ethnic and religious community that is distinct and different from the kingdom that had invaded the former appears to have been a contributory factor. But unlike Thailand, the minority in question was at various points in history — and certainly in the first couple of decades after Independence — accepted into the mainstream which might suggest that the genesis of the conflict did not have that great an impact. It is equally significant that the acceptance of the Rohingyas coincided more or less with that period in Myanmar’s political history before the military which usurped power in 1962 succeeded in tightening its grip upon authority. The earlier part of this period especially between 1948 and 1958 when Myanmar was a parliamentary democracy was a time when not only the Rohingyas but also other minorities such as the Shans, Kachins, Chins and Karens had some political and cultural space to articulate their rights and to protect their identities. (17) It shows that ethnic minorities are relatively safer and more secure within a democratic framework, as the Thai experience also proves to a limited degree. Needless to say, Myanmar establishes yet again that military authoritarianism — this is also true of Thailand — is the greatest challenge to the integrity of minority groups like the Rohingyas. Indeed, the situation is much worse in Myanmar for a majoritarian military mindset has been wedded to an ideology that unashamedly expresses hate and fear towards a small, weak and helpless minority. It is this politics of hate and fear that has spawned an ethnocide that is riddled with religious bigotry. The Muslim dimension of Rohingya identity has become the object of a form of Islamophobia. This is why right at the forefront of this virulent campaign against Rohingya Muslims and Muslims in general in Myanmar are some Buddhist monks with substantial followings like Ashin Wirathu of Mandalay who in his speeches has presented Muslims — given their alleged fertility — as a huge demographic threat to the Buddhist majority. He has also railed against the Muslim role in the economy. ( 18) The 969 movement of which he is a leading light seeks to discourage Buddhists from patronizing Muslim businesses and wants the State to impose severe restrictions upon Buddhist-Muslim marriages. (19) That the 969 movement is growing is an indication of the danger posed by ethno-religious chauvinism parading as Buddhist nationalism in an ethnically and religiously diverse society. Wirathu and others of his ilk have succeeded to some extent in fusing rabid ethnicity with religious bigotry — a combustible combination which threatens to subvert some other societies too in Asia and elsewhere. It is partly because of the ethno-religious chauvinism of some monks and a segment of Buddhist society that a section of the Rohingyas and Muslims in Myanmar have begun to adopt more exclusive and antagonistic positions on issues pertaining to religion. (20) They are reluctant to reach out to Buddhists in their neighborhood and work-place. They have become increasingly susceptible to narrow, sometimes even fanatical interpretations of Islam propagated by Wahabi preachers and the like. What this suggests is that popular sentiments among Buddhists and, to an extent, Muslim Rohingyas do not conduce towards the promotion of better understanding and harmony between the two communities. Because these sentiments are not only pervasive but also entrenched, politicians seeking power and position in the forthcoming general elections in 2015 will not dare to swim against the tide. On the contrary, most of them are already exploiting and manipulating religious and ethnic emotions for votes. The party linked to the ruling elite for instance, the Union Solidarity and Development Party, is projecting itself as the true defender of Burmese, Buddhist identity. Even the National League for Democracy (NLD) of Aung San Suu Kyi which enjoys some support among the Rohingyas has maintained a deafening silence in the face of their persecution because it needs the endorsement of the majority Buddhist community especially the Buddhist clergy. This shows that while democracy allows for the representation of community interests, the electoral process sometimes serves as a conduit for the escalation of religious and ethnic emotions which in turn leads to a deterioration in inter-community relations. In other words, electoral democracy can also be a cause for inter-religious tensions and inter-ethnic ruptures. This brings us to yet another cause which, in a manner of speaking, lies outside Myanmar. Geopolitical rivalries may also be responsible for the perpetuation of the conflict between a segment of the Buddhist community and the Rohingyas. For more than a decade and a half now, the United States has been concerned about what it perceives as growing Chinese influence over the government of Myanmar. This influence manifests itself in various ways, especially through Chinese investments in infrastructure development, trade and aid. China has also developed extensive linkages with plans and projects aimed at harnessing Myanmar’s rich, untapped resources. Given Myanmar’s strategic location vis-à-vis the Bay of Bengal and the Indian Ocean, the US is apprehensive that China may use its economic ties with Myanmar to extend its reach into the Bay and the Ocean. This could have an adverse impact upon the US’s dominant position in the Indian Ocean — reflected in its base in Diego Garcia — and its global hegemony. From Myanmar to Sri Lanka, there are some similarities in some of the causes behind Buddhist-Muslim tensions. I shall analyze these similarities after I have looked at the nature of the conflict itself between elements from the two communities. At the center of this campaign is the drive to rid the country of halal certification. (23) Some Buddhists argue that requiring shops and supermarkets to carry the halal label is an unjust imposition of an Islamic tenet upon the ninety-one percent non-Muslim population. The halal issue has divided society and intensified negative sentiments towards the Muslim minority. The group behind the halal issue, the Bodu Bala Sena (BBS) is the most radical anti-Muslim group in Sri Lanka today. Its leader is a Buddhist monk, Galagod Aththe Gnanasara Thero who has developed a significant following through his pronouncements and actions which denigrate the Muslims and Christians while seeking to glorify Buddhism and Sinhala identity. (24) The BBS and Gnanasara insist that the purity of Sri Lanka as a Buddhist, Sinhalese state should be protected and preserved from the pollution of minorities such as the Muslims who are determined to cling on to their own way of life. And indeed, for some Buddhists in Sri Lanka it is the Muslim attachment to halal products, a distinct attire for women, a notion of identity that separates the latter from the former, which is the real problem. The Muslims, they allege, do not want to conform to the demands of a Buddhist state. It has given rise to tensions and conflicts between the majority and the minority. Of course, there are both monks and politicians who argue that increasing Wahabi type thinking and practices among Sri Lankan Muslims have also exacerbated the situation. Money and missionaries from Saudi Arabia and other Gulf monarchies are the source. It is said that wealthy Saudis have also been buying land and properties from Sinhalese some of which are then converted to mosques and madrasas. If one reflected upon these causes, one would realize that there are some similarities to Myanmar. Majoritarian chauvinism would be one of them. The role of monks and politicians would be another. The growth of narrow, exclusive attitudes among the Muslim minority would be a third parallel. There is perhaps a fourth parallel related to geopolitics. Like the Myanmar government, the Rajapaksa presidency has also developed close ties to Beijing. In fact, the war brought Rajapaksa closer to Beijing as China became one of the main suppliers of weapons to the government. Sri Lankan naval facilities have also been made available to Chinese warships. Expanding military ties between the two nations should be viewed in the light of growing Sri Lanka-China trade and economic exchanges. The US, needless to say, is uneasy about this bilateral relationship. So is Britain. It is one of the reasons why both these countries and other Western states are targeting Sri Lanka on its human rights record. They have been extremely critical of Sri Lanka’s alleged suppression of, and discrimination against, the Tamil minority during and after the war. Now they are focusing upon the government’s alleged failure to protect the Muslim minority. Once again, a nation’s human rights performance is on the radar screen — perhaps for valid reasons — but the actual motive for the scrutiny may be something else. To state the obvious, Sri Lanka’s military relationship with China impacts upon the US hegemon’s interests in the Indian Ocean. Reflecting upon the experiences of the three countries in the Bay of Bengal, one is now in a position to draw out some common threads which are important in understanding Buddhist- Muslim conflicts within the domestic sphere. One, it would be unwise to ignore the historical roots of a conflict. It is these roots —in the case of Thailand and Myanmar — that explain some of the concerns that color the conflict to this day though the depth of their impact would vary from situation to situation. Two, harsh, authoritarian rule, often associated with the military, appears to be a major cause of the perpetuation of a conflict. A majoritarian psychology that justifies exclusiveness and dominance underpins such rule. Three, the persecution of the Muslim minority takes certain predictable forms. The hijab (Muslim female attire) is often targeted. Mosques, Muslim businesses and Muslim birth rates are also targets. In Sri Lanka an important Muslim identity –marker — halal certification — has attracted extraordinary attention from leaders claiming to represent the Buddhist majority. Four, more significant, in both Myanmar and Sri Lanka, an ideology of hate and fear that distorts Buddhism and dovetails it to narrow nationalism has emerged justifying exclusiveness and dominance. Some monks have projected themselves as the interpreters of this ideology. They have consciously lent moral legitimacy to the marginalization and persecution of the Muslim minority. Five, if monks are the creators and interpreters of this ideology, politicians are their peddlers. In all three countries politicians have manipulated issues related to Buddhist-Muslim ties in pursuit of their own political agendas. Electoral politics seems to have whetted their appetite for such manipulation. Six, narrow, bigoted attitudes among some Muslims in all three countries — sometimes a reaction against some of the positions adopted by elements among the majority —have aggravated the situation. Such attitudes also stem from atavistic interpretations of the religion by Muslim religious leaders themselves. Seven, democratic governance may in some instances help to reduce tensions, reconcile antagonistic positions and offer solutions to inter-ethnic conflicts. But when mass sentiments are mobilized along ethnic lines, democracy becomes a conduit for the articulation of base communal feelings which invariably threaten inter-ethnic peace. Outside domestic politics, there is yet another common thread which this analysis has revealed. This is the geopolitical dimension of the conflicts in the region. In both Myanmar and Sri Lanka —- less obvious in the case of Thailand — Buddhist-Muslim tensions are now enmeshed in the larger struggle for geopolitical influence in the Bay of Bengal and the Indian Ocean between an established superpower and an emerging world power. The US, there is no need to repeat, is as determined as ever to maintain its dominance over the Indian Ocean and will brook no rival. This is a crucial aspect of its “Pivot to Asia”, euphemistically described today as “rebalancing.” Since the US perpetuates dominance partly through regimes that are allied to it, the present inclination of the governments in Myanmar and Sri Lanka — as I have noted — is not to its liking. This is why it is quite conceivable that the US Administration will continue to be actively involved in the politics of the two countries. China, on the other hand, realizes that as its economic muscles get stronger, it needs greater access to both resources and routes. (27) Its ties with Myanmar ensures the first while its relationship to Sri Lanka facilitates the second. As it seeks access, China is bound to collide with the superpower that is bent upon perpetuating its hegemonic control. At the moment, there has been no open flare-up between the two in the Indian Ocean — unlike the South China Sea or the North China Sea where skirmishes between the Philippines and China, on the one hand, and Japan and China, on the other, conceal and camouflage deeper tensions between the US and China. However, the danger of a more insidious conflict between the two is ever present. In order to curb and control the growing influence of China in Asia, the US elite may choose to employ a tactic that most imperial powers have resorted to in their desire to perpetuate their hegemony. It may play community against community, religious group against religious group in different countries in the region. In other words, it could embark upon a policy of “divide and rule.” Muslims and Buddhists — more than other religious communities in Asia — should be cognizant of this. In a number of countries all over the continent, Buddhists are the majority and Muslims are a minority and vice-versa. In the three countries that are part of this study, for instance, Buddhists are the majority community while Muslims are a minority. However, in Indonesia and Malaysia, Muslims are in the majority and Buddhists are a minority group. It is significant, that in the Association of Southeast Asian Nations (ASEAN) with its 600 million inhabitants, 42% are Muslim and 40% are Buddhist. If Muslims and Buddhists are embroiled in continuous friction and conflict not only will individual ASEAN states suffer but ASEAN as a regional entity will also be crippled. This will only serve the interests of those who want to see ASEAN sapped of its strength. China will be deeply concerned if ASEAN is in turmoil. When your neighborhood is in chaos, your own peace and stability will be adversely affected. This is why it is critical that Muslims and Buddhists who live cheek by jowl, within and without ASEAN, develop harmonious relations between them. They should not allow anyone to exploit their differences with the aim of controlling and dominating their societies. How will Buddhists and Muslims cultivate harmonious relations? How much has been done so far to overcome the challenges facing the two communities? I shall first focus upon the efforts of governments, inter-governmental organizations and international bodies and then examine the contributions of civil society actors, specifically NGOs. Governments, Inter-Governmental Organizations and International Bodies. Since the sixties the Thai government has made attempts to solve the conflict in southern Thailand. These attempts have come in fits and starts. The first serious endeavor to address the root causes of the conflict and propose viable short-term and long-term remedies was through the establishment of a National Reconciliation Commission (NRC) in March 2005. The NRC chaired by a former Prime Minister, Anand Panyarachun had representatives from different religious and ethnic backgrounds. One-third of its members were Muslims from the South. Buddhist monks, social activists, academics and other public figures were also members of the NRC. The NRC submitted its report to the Thaksin government in June 2006. It produced some outstanding recommendations. It proposed the establishment of a Strategic Administrative Center for Southern Border Provinces. ( 28) Through this center, the local population in the South, specifically the Malay Muslims of Yala, Narathiwat and Pattani, would manage their own affairs. The Pattani-Malay language would be recognized as a working language in the three Malay majority provinces. Aspects of Islamic law would also be applied. The NRC also suggested ways of dealing with the problem of unemployment, of improving the education system and of building confidence in the judicial process. It called upon the authorities to act decisively against state officials who abuse their power. The NRC even urged the state to engage with the militant groups through sustained dialogue. Unfortunately, the NRC’s enlightened report was never implemented. It became a victim of Thailand’s highly charged, partisan, divisive politics. Since 2006, it is this divisive politics that has taken center stage. Now a military junta is back in the saddle of power. It is doubtful if it would be inclined to address the challenge of the South. Consolidating its own power would be its main preoccupation. In passing, it should be observed that over the last 20 years or so, there have been moves to involve the Malaysian government obliquely in the challenge of restoring peace and stability in the South. The Malaysian government has been receptive to these overtures but the complexity of the situation especially the problem of identifying the real leaders of the militant groups, and the approach adopted by some elements in the Thai security hierarchy who place a high premium on law and order above everything else, have stymied these efforts. When one compares Thailand to Myanmar, one gets the impression that the Myanmar government is not even prepared to acknowledge that there are issues connected to the Rohingyas that should be addressed. It has denied that certain massacres ever took place. Even when it admits that the security forces had killed Rohingyas, there is hardly any attempt to prosecute the wrongdoers. This is one of the reasons why some analysts have concluded that the state is complicit in at least some of the massacres. The Myanmar government is also hostile towards any attempt to involve so-called “outsiders” in resolving the Rohingya issue. ASEAN of which Myanmar is a member has not been allowed to discuss the plight of the Rohingyas, mainly because of the staunch opposition from the Myanmar government. It is only on the sidelines of ASEAN summits or other conferences that other ASEAN leaders have tried to talk to the Myanmar president about his country’s treatment of the Rohingyas. Besides, it should be remembered that ASEAN itself has a fundamental rule about “non-interference” in the internal affairs of member states. Another inter-governmental organization, the Organization of Islamic Cooperation (OIC), was also given the cold shoulder when it attempted to seek some answers to questions about the Rohingyas. When a delegation from the OIC led by its then Secretary-General, Ekmeleddin Ihsanoglu, visited riot-hit areas and Rohingya refugee camps in Rakhine in November 2013, it was greeted by anti-OIC demonstrators opposed to the visit. It is suspected that the demonstration was organized with the connivance of the government. It is apparent that while the Myanmar government does not want to come to grips with the question of citizenship for the Rohingyas, it will not accept advice or guidance from any regional, inter-governmental or international organization. Perhaps it knows that its quiet defiance of world opinion will not result in sanctions being imposed against it or in other punitive measures for the simple reason that everyone is now vying to invest in resource-rich Myanmar. The attitude of the Sri Lankan government towards the problem of rising tensions between the Buddhist majority and the Muslim minority is not very positive either. True, it recognizes that there have been incidents which have led to a deterioration in inter-religious ties. But the government does not act firmly and decisively against the guilty. Indeed, there have been occasions when law enforcement agencies appear to be reluctant to rein in an overtly aggressive monk or a Muslim baiting politician. This has given rise to allegations that certain ministers and public officials are complicit. They are protecting or even encouraging BBS. It explains why the state appears to lack the political will to fight hate speech and acts of sacrilege against the Muslim minority. Like their Myanmar counterparts, the Sri Lankan elites also bristle at criticisms from “outsiders.” (30) Individual Western governments have been taken to task for their comments on the country just as the Sri Lankan government was offended by the OIC’s condemnation of its handling of the Muslim minority. A number of UN human rights experts and the UN High Commissioner for Human Rights have also incurred the wrath of Sri Lankan officials for their negative views on the Sri Lankan government’s human rights record vis-a- vis its Muslim minority. While a lot of these criticisms have a basis, one should not be naïve and ignore the possibility — given other situations — that there may be some exaggeration. There may not be incontrovertible evidence in some instances to support the contention of some government critics that it is the government that is orchestrating all the attacks against the Muslims. One should also bear in mind that there are external actors who have a stake in chastising and denigrating the Sri Lankan government. As noted previously, it serves their geopolitical agenda. My analysis has shown that for different reasons the three governments have not done enough to address the challenges related to Buddhist –Muslim ties in their respective countries. Neither are inter-governmental and international organizations in a position to act. This leaves us with civil society actors or non-governmental organizations (NGOs). What have they done to reduce friction and conflict between Buddhists and Muslims in the region and enhance harmony and amity between the two? NGOs from within and without the region have been vocal articulators on issues pertaining to Buddhist-Muslim relations in Thailand, Myanmar and Sri Lanka. Given the breadth of their work, it will not be possible to offer even a brief review of their activities. What I will do instead is to look at the role played by my own NGO, the International Movement for a Just World (JUST) on the question of Muslim-Buddhist ties for eighteen years. JUST’s modest contribution is in a sense a microcosm of what NGOs as a whole have been doing in this area. In trying to address challenges faced by the two communities, JUST, a multi-religious international NGO with a Muslim majority based in Malaysia, has partnered a handful of Buddhist NGOs. The International Network of Engaged Buddhists (INEB) has been our constant partner in this endeavor. We have also joined hands with Soka Gakkai Malaysia at various times and cooperated with the Taiwanese Buddhist monk, Master Shin Tao’s Global Family for Love and Peace and his Museum of World Religions in organizing Muslim-Buddhist dialogues in Kuala Lumpur, Jakarta and Paris. JUST’s first venture into the realm of Buddhist-Muslim dialogue was in 1996 when it joined the Bangkok based Santi Pracha Dhamma Institute, an educational outfit under the spiritual leadership of Ajarn Sulak Sivaraksa, one of the founders of INEB, to convene a conference in Penang, Malaysia on the theme “Alternative Politics for Asia” which sought to establish the relevance of eternal spiritual and moral values garnered from Islam and Buddhism for the transformation of contemporary Asia. (31) Since then JUST has initiated and participated in numerous Buddhist-Muslim dialogues in different parts of the world. By and large, there are three dimensions to JUST’s approach to Muslim – Buddhist relations which may resonate with the work of other NGOs as well. One, addressing eruptions in relations between the two communities in a fair and equitable manner. Two, proposing mechanisms and instruments to improve relations between Muslims and Buddhists. Three, emphasizing shared values and principles in the philosophies of the two religions that could help to strengthen their bond as they struggle for a more just and compassionate world which enhances the dignity of all living beings. One, from the very outset, JUST reckoned that eruptions that occur from time to time in the interaction between Buddhists and Muslims will have to be addressed with courage and integrity. Hence, our strong stand against the destruction of the Bamiyan statues in Afghanistan in 2001 which gave birth to JUST’s international campaign on the protection of places of worship that elicited support from a wide spectrum of groups and individuals from all over the world. (32). At the same time, incidents like Tak Bai in Thailand in 2004 or the persecution of the Rohingyas in Myanmar in recent years have also evoked a principled response from JUST. It is because of our just position on what are perceived as Buddhist or Muslim concerns that we have succeeded in gaining the trust of both communities which is a vital prerequisite for keeping the channels of dialogue open. The first principle is that both Islam and Buddhism recognize the primacy of the spiritual and the moral as against the material and the sensate. For Islam, the root of that spiritual basis of human existence is Allah; for Buddhism it is Nibbana. This fundamental principle is linked in turn to two other inter-related principles: the principle of upholding what is right and the principle of prohibiting what is wrong. It is significant that the concept of virtue in Islam and Buddhism bears many striking similarities. Honesty, truthfulness, kindness, a sense of justice, a feeling of compassion towards the weak are values which both religions cherish. Equally significant, both Islam and Buddhism adopt a similar position on a whole gamut of vices. It is not just murder or theft or lying that they regard as wrongdoings. Gambling, the consumption of intoxicants and adultery are condemned in the two religions. 1) Living in harmony with the environment and protecting natural resources for future generations. 2) Establishing government and political authority on a moral basis. 3) Developing the economy guided by ethical principles. 4) Strengthening the family as the moral foundation of society. 5) Reinforcing the integrity and cohesiveness of the community. 6) Ensuring amicable, cordial relations between different religious and cultural communities. These shared principles and values it should be emphasized do not imply in any way that the two religions are the same. There are vast differences in theology and ritual which distinguish Islam from Buddhism. Nonetheless, they uphold certain ethical concerns which are fundamental to the life of a practicing Muslim or Buddhist. It is in this regard that the 1+2+7 formula could serve as a basis for Muslim –Buddhist cooperation for the larger good of humankind. Of course, the 1+2+7 formula will mean little for segments of Buddhists and Muslims in Thailand, Myanmar and Sri Lanka ensnared in friction and conflict. Nonetheless, those of us who are committed to ensuring peace and harmony between Buddhists and Muslims in the region and beyond should not cease to remind both communities of what is good and beautiful in their religions. By the same measure, however difficult the situation may be in some societies, we cannot abandon our duty to speak truth to power — whether it appears in political or religious garb, at the national or international level. And the truth will be heard because we live in an age where marginalized, dissident voices can no longer be ignored. If the ravings of bigots sometimes saturate the air, it is because the wise have chosen to remain silent. With all the channels of communication that are available to all of us today, it is an unforgivable sin to remain silent in the face of bigotry and hatred. For Buddhists and Muslims in the Bay of Bengal nothing is more urgent at this moment than speaking and acting on behalf of justice and compassion — the sort of justice and compassion that understands the pain of the other. 1) According to population statistics estimates for 2014, of the 67.3 million people in Thailand, only 3% are Malay Muslims. 3) See Omar Farouk Bajunid, “ The Malaysian Factor in the Prospects for Peace in Southern Thailand” in Understanding Conflict and Approaching Peace in Southern Thailand Imtiyaz Yusuf and Lars Peter Schmidt ( editors) ( Bangkok: Konrad Adenauer Stiftung, 2006) Second Revised Edition. p. 196. 8) See Ukrist Pathmanand, “ Religious Issues in Political Conflict During the Late Thaksin Government” in Religion and Democracy in Thailand Imtiyaz Yusuf and Canan Atilgan ( editors) ( Bangkok: Konrad Adenauer Stiftung, 2008) pp. 83-4. 10) Myanmar, then known as the Union of Burma achieved Independence from British colonial rule in 1948. The Father of Burmese Independence, Aung San, envisaged a multi-ethnic nation dedicated to freedom and justice. 16) These killings are discussed in Mozammel Haque, “ Ethnic Cleansing of Rohingya Muslims” The Muslim World December 2012 pp. 12-15. 18) Wirathu says that he wants to protect Buddhists in Rakhine from “Bengalis” terrorizing them. According to some media reports he has now changed and appears to be more inclined towards peace and non-violence. 19) 9 stands for the nine special attributes of the Buddha; 6 for the six special attributes of his Dhamma; and 9 for the nine special attributes of his Sangha. 21) There are numerous examples of this in Human Wrongs Chandra Muzaffar ( editor) (Penang, Malaysia: JUST World Trust, 1996). 22) See Religious Violence in Sri Lanka January 2013 — December 2013 An Update of Muslim Concerns Presented by the Sri Lanka Muslim Congress to the United Nations High Commissioner for Human Rights, August 2013. 23) See Hate Incidents against Muslims: January — April 2014 especially entry for January 7 2014. 24) For a peep into his attitudes see Sri Lanka’s Militant Monk Rejects Dalai Lama as Spiritual Leader July 22 2014. 25) See Religious Violence in Sri Lanka Op.Cit Annexure 11 Violence Against Christians. 29) See “Myanmar Rejects UN Resolution on Rohingya Muslims” Reuters Yangon 21 November 2013. 31) The book that came out of that dialogue is entitled, Sulak Sivaraksa and Chandra Muzaffar Alternative Politics for Asia: A Buddhist- Muslim Dialogue ( Kuala Lumpur, Malaysia: International Movement for a Just World, 1999). 33) See “Dusit Declaration” JUST Commentary July 2006. 35) The Buddhist-Muslim Forum was launched at a meeting attended by activists from a few organizations including JUST and INEB in Galle, Sri Lanka in August 2013.